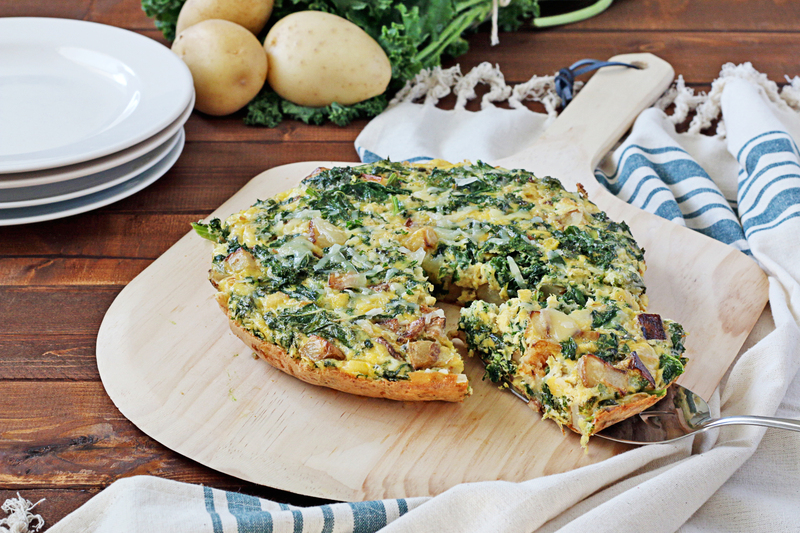 This Kale, Potato and Pecorino Frittata is courtesy of In Sock Monkey Slippers as part of the U.S. Potato Board’s Potato Lovers Club program. Preheat oven to 400°F. Heat 1 tablespoon of oil over medium heat in a 10-inch ovenproof and nonstick skillet. Add potatoes, season with a pinch of salt and pepper, and sauté until golden brown and tender, about 10 minutes. Remove potatoes and set aside until needed. Add the remaining oil to the skillet and add garlic and kale and season with a pinch of salt and pepper. Sauté until kale is wilted, about 5 minutes. Add potatoes and mustard; stir to combine. Stir in beaten eggs and cheese. Remove from heat and place in the oven. Bake for 20 minutes or until cooked through and a toothpick inserted in the center comes out clean. Once the frittata is finished, run a knife around the edge of the skillet and gently slide the frittata to a carving board or serving plate.